The hotel ballroom is full, the round disks of tables spaced just-so to allow movement and mingling despite the roar of 450 voices. In its midst, Javier Nieto is the calm in the storm. Still not even on the payroll on this September morning — his first day was October 31 — he warmly meets college friends, working to make his voice heard above the din. He waits patiently by the stage, on which are perched four white, modern leather chairs and a single podium, bathed in spotlights, ready to welcome the crowd of health care heavy hitters — his new peers — to the third annual Portland Business Journal Healthcare of the Future event. The crowd jostles for seats, and plates and coffee are passed as the Journal’s publisher tries to capture the attention of guests. Caterers, still scrambling to get breakfast on every table, drop a plate. Without missing a beat, Javier leaves his post to retrieve it then heads to the stage to make his debut as the new dean of Oregon’s first accredited college of public health and human sciences. Such is the life of a servant leader. “I work for you,” he tells faculty during the fall all-college meeting a day later. And he means it. He also believes that it is critically important to leverage the connections of the dean’s office to bring other disciplines to work together. “It is very clear to me that practically all of the academic disciplines at the university do work related to public health. “Give me one sector of the economy or society that does not influence the health of people. Politics, economics, law, environmental sciences, agriculture and engineering — they all impact health. What’s important to me is bringing faculty and programs across the entire campus and beyond to work with us on our research and educational programs. Servant leadership was coined by Robert K. Greenleaf in the essay “The Servant as Leader.” Instead of concentrating power at the top, the servant leader puts the needs of others first and helps them perform their best. The college is uniquely positioned to assist communities in this effort, he says, in part because of its breadth of scientific expertise, including not only the traditional public health disciplines, but also human sciences expertise in nutrition, kinesiology and human development and family sciences. 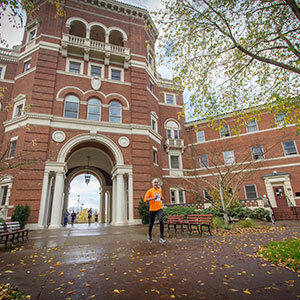 The Oregon State University Center for Health Innovation and OSU Extension Service also enhance the college’s ability to engage communities. Health Extension faculty embody the university’s mission to be a university for the people, and that mission was a significant draw for Javier, who sees it extending far beyond Oregon’s borders. Thinking globally comes naturally to Javier. Born in Ponferrada, a small town in northwestern Spain, he grew up in Valencia, on Spain’s eastern coast, as the middle child in a family of seven. Two of his siblings would go on to become pediatricians like their father. For Javier, who came of age in the late ’60s/early ’70s in a political environment of unrest, those formative years sparked an interest in social justice and politics. Javier enjoys running and participated in his first college run as dean at the 2016 GridIron Chef Contest and 5k Fun Run. Javier’s career in public health, however, wouldn’t begin until after his medical training. Following medical school and a residency in family and community medicine in Spain, he set out to earn his master of public health degree in Cuba. “This was a really transformative experience for me,” he says. “It reinforced my interest in public health and the impact it can have on communities. It convinced me that with the right public health and primary health care approaches you can do a lot to preserve the health of the population, even if resources are limited. And here he is: Oregon. An opportunity to make a difference in a new way. The latest stop on his life journey. “I was very drawn to the vision of the college — by the energy and the quality of its people,” he says. “This position is exciting, and I feel good about the opportunity and potential that this college has. It’s in a good position to make a meaningful impact for Oregon and as a model for those who might follow. I’m enthusiastic about working to help fulfill our mission of lifelong health and well-being for every person, every family and every community. And to work toward ensuring our students’ success and to connect and engage with alumni and friends. He is currently reading “The Short and Tragic Life of Robert Peace” by Jeff Hobbs. He loves fiction, particularly mysteries, and two of his favorite authors are Paul Auster and Ian McEwan. Two books that impacted him in recent years are “Cutting for Stone” by Abraham Verghese and “A Fine Balance” by Rohinton Mistry. A longtime runner, he ran a marathon two years ago. He bikes to work as frequently as he can. “Almost everything.” Most of the time he listens to classical music or opera; Puccini’s “Turandot” and Machler’s symphonies are among his favorites. He also enjoys rock and pop music, including The Beattles, Regina Spektor and Wilco. He and his wife, Marion, have three children. Diego is interested in cultural anthropology and attends Lewis & Clark College in Portland. His fraternal twin, Miguel, studies architecture at the University of California, Berkeley. Daughter Lucia is passionate about soccer and just started her first year at the University of Wisconsin-La Crosse. He met Fidel Castro – twice – while studying in Cuba. He sang with the Madison Symphony Choir while in Wisconsin and plays viola. He’s an amateur photograph with an Instagram account.